The Denon remote app allows you to control your Denon AV receiver and browser and play music from internet music sources as well as airplay and NAS. First when you launch the Denon remote app you can select a Denon device, this will search for compatible Denon devices available on your network. In this video the Denon AVR-X3200W will be used as an example. When it appears on the list, you can select it. If you have multiple devices connected to your home network they will all be listed here. However if you have older devices these will be listed as incompatible devices. If you select one of these it will load the previous version of the app, or if the app has not yet been installed on your device it will guide you to the app store to download it. Now lets select the Denon AVR-X3200W, next you will see the AV receivers menu. If you tap on the menu icon in the top left icon a new menu will appear. On top you will see the controls option, which allows you to control your AV receiver, this is the section you’ll use most frequently. Below the controls options you will find the AV receivers setup menu. In this section you are able to make changes to all settings in your AV receiver. Here you will find a separate section for each of the items which you can adjust the settings. 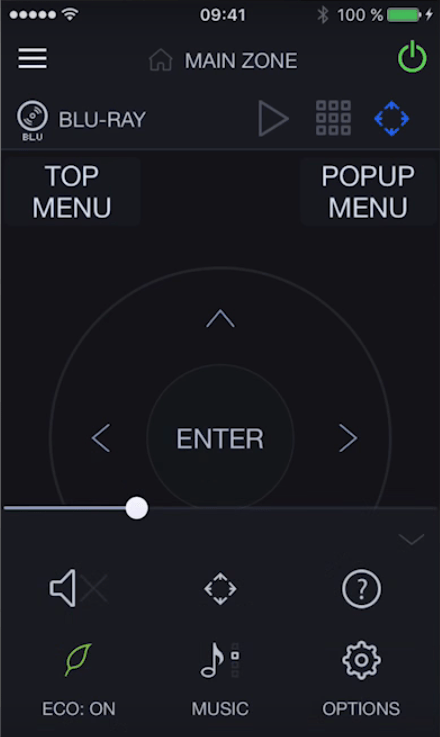 Below these settings on the menu a separate section gives you access to the app settings, and also the option to select another AV receiver that you would like to control. Lets go back and start controlling our AV Receiver. On the main page, difference sorts of information are presented in a clean and intuitive design. At the top of the page you see which zone you are controlling in this case the main zone. If you tab it you can switch between different zones, control their volume levels and switch zones on and off. Back on the main screen, on the left side you can see which source is selected for that particular zone, tapping this allows you to select another source, we will use Blu-ray as the source in this case. The available functions in the middle of the screen depend on which source is selected, as we have Blu-ray selected as a source here, transport functions like play, stop, pause and skip forward and backward are shown. Next to the blue triangle, you see little squares that give you access to the other screens such as the dial screen and the four arrows of the navigation screen. If you select another source for example online music or music server, the available options will be different. 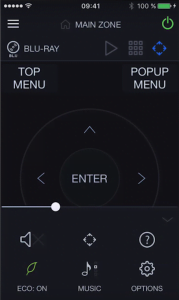 At the bottom of the Denon remote app you will find useful direct access buttons like mute, cursor, info, eco mode, sound mode and options. The info button will who you tips on the app and offers direct access to the online user manual, or customer support. This section can be hidden but the volume slider will always remain available. It’s all very easy and user friendly.